In the amount of time it took for you to enjoy that action shot, Dr. Dan would be approximately half a mile ahead of you because he kept walking. Today, we rose before the sun to hike the MacRitchie Reservoir and the Bukit Timah Summit. 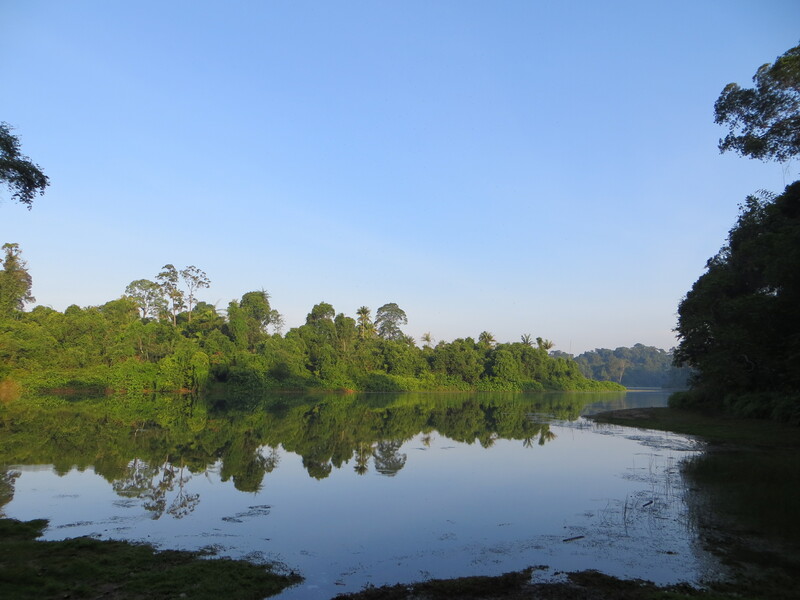 We started at the MacRitchie Reservoir Park, which is the largest of Singapore’s reservoirs. 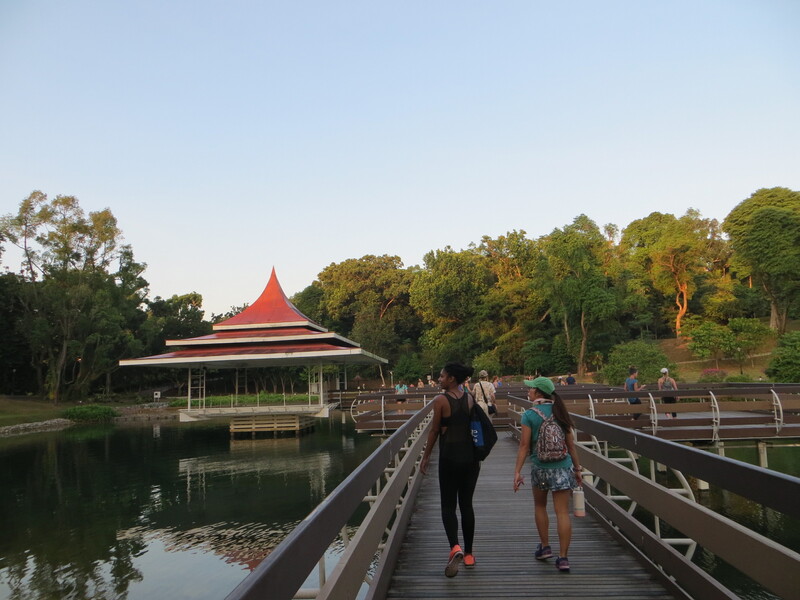 MacRitchie, like most of Singapore’s nature parks, was already full of people rowing, walking, running, meditating, playing music, or doing yoga by the time we arrived. Victoria and Cindy drowsily begin the hike. Dr. Dan can be glimpsed through binoculars wearing a gray shirt up ahead on the right. This is one of the few sightings of Dr. Dan on the trail. After meeting a flying snake earlier this week on a hike, I decided not to wander too far from Tom who carries our first aid kit. As we entered the forest, we headed towards the TreeTop Walk path. Upon seeing the number of kilometers we had ahead of us, Victoria politely uttered “What the inferno.” Dr. Dan kept walking. The MacRitchie hike began with views of the reservoir. We did not see fish, but we did see mosquitoes! Either way, the water was beautiful. The trees along the trail formed a roof over our heads not unlike the hedge maze in Harry Potter and the Goblet of Fire. Near the beginning, there were so many runners going the opposite direction on the trail that half of our class became separated. When the stampede dispersed, Dr. Dan, the graduate students, Katie K., and Caroline were gone. Shocked at their disappearance, I questioned whether it is possible for a primate to kidnap a human being outside of the movie Tarzan. 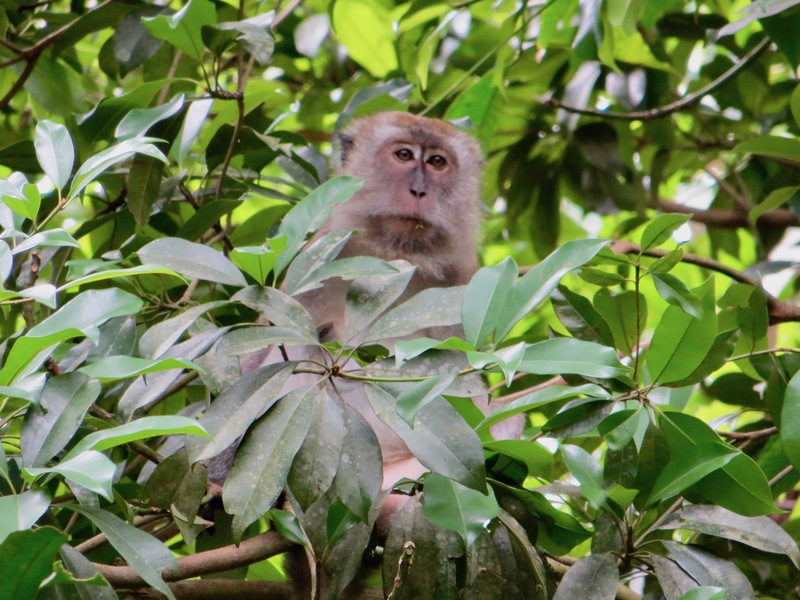 Glancing at the hanging vines and branches (to check for snakes), I realized that I had lost my buddy, Katie K., to a macaque. Before I could worry more, Tom gave a shout to speed up until we made visual contact with our faster half. I, being at the head of our pack, began moving at what would later be described by Victoria, Cindy, and Katie R. as a breakneck speed. Little did they know, I was recruited to Duke for speed walking. A few miles later, we still had not caught sight of our group, so I attempted to distract myself by walking faster. Soon, we reached the TreeTop Walk, and, thinking that our hike was nearly complete, I allowed myself to finish 70% of my water. That was a mistake. The TreeTop Walk consisted of a bridge suspended over the forest. We were so high up that if it weren’t for the copious “Watch out for monkeys” signs (they can get you anywhere), I would have put my bag down to do yoga. We had been in the dense forest so long that it seemed strange to suddenly be floating above it. Looking down, you would not be able to identify where the trail had been. It was as though we had traveled to a nearly untouched forest, remote from the bustling port city. 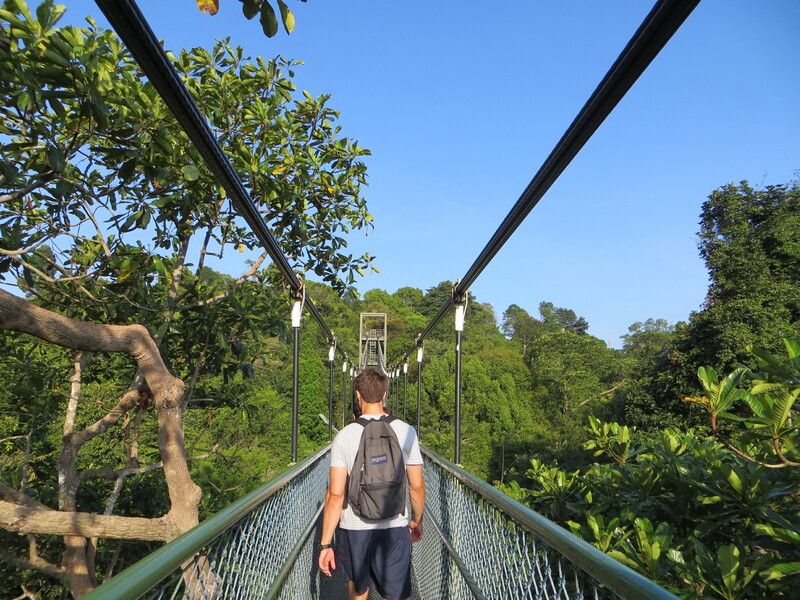 This free standing suspension bridge connects between MacRitchie’s two highest points. After heeding Tom’s shout to stop for a water break, we began to wonder where the second half of our class was. Tom turned back to try and get a cell signal to contact Dr. Dan who was probably still walking. Meanwhile, Cindy, Victoria, and Brandon analyzed the map to determine exactly where we were. 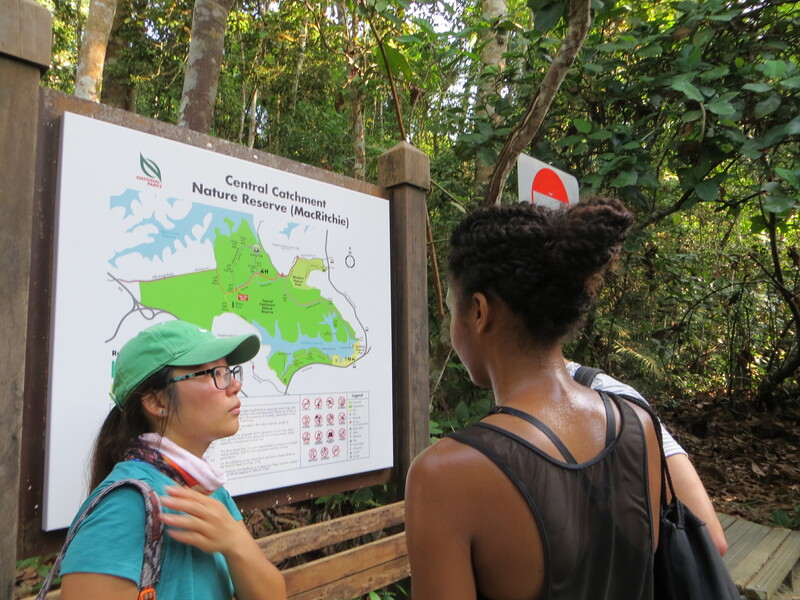 Katie R. cautiously began eating dried fruit while resident Monkey whisperer Daria kept an eye out for macaques. By the time Tom returned, our legs had begun to cramp, so he led us through some stretches under the watchful eye of future physical therapist Cindy. With a polite “we need to go slower because we could twist an ankle at this speed on the rocks on this trail,” we resumed our hike. At one point, we heard noises from above and looked up to see a trio of macaques gleefully leaping from tree to tree. A macaque that did not steal from a yoga goer (at least not that I’m aware of). By the time I ran out of water, we were dodging mountain bikers, still hiking up rocky hills, and even beginning to crave durian. After climbing what we hoped would be the last rock stairs (we ended up climbing 62 flights of stairs and hiked over 10 miles) we reunited with our lost half! Apparently they had “accidentally” taken a shortcut. 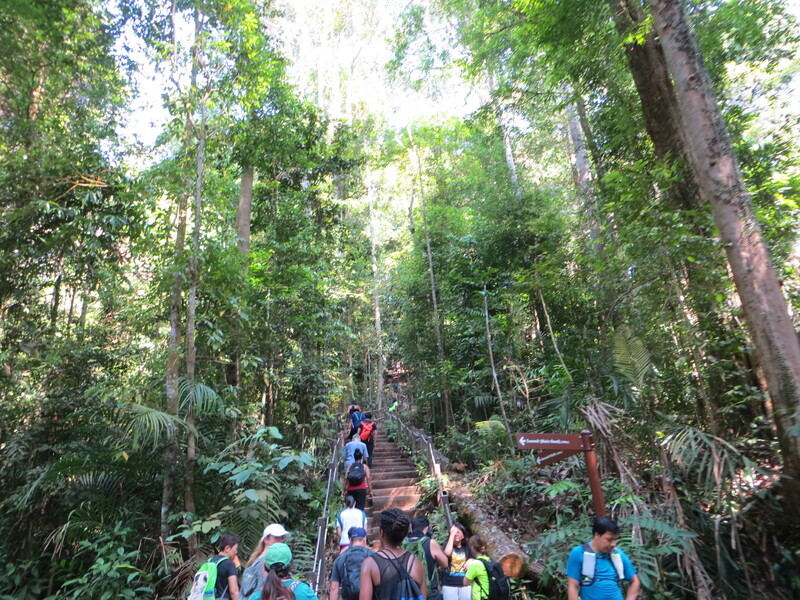 Unfortunately, we still had this set of stairs to climb until we could reach the summit of Bukit Timah. Once we finally reached the top, we enjoyed the highlight: this rock. 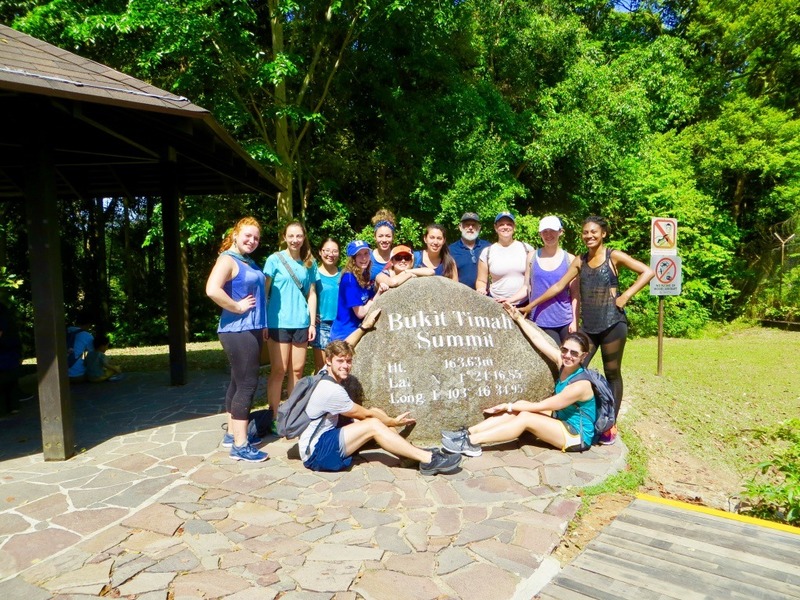 Bukit Timah Summit is actually the highest altitude that you can reach within Singapore. At 163.63 meters, it is the closest thing to a mountain that Singapore has. To clarify, we climbed Singapore’s Mt. Everest! Fortunately, we opted to follow the slope down. For the first time, years of geometry helped me identify that it was necessary to lean backwards at a 65 degree angle to avoid falling face first and rolling down the hill. If Singapore was not a balmy 88 to 99 degrees every day, this hill would be great for sledding. From the base of the slope, we walked to Al-Azhar, an Indian, Malay, Thai, Halal, and Western restaurant for lunch, or in some students’ cases, brunch. Upon sitting down, we were promptly handed menus the size of an Organic Chemistry textbook to ensure that even the pickiest eater would find something they liked. After eating and sharing the delicious food with each other (two weeks in, of course every meal is family style), we slowly headed to the MRT. To the other people in our train car, I apologize on behalf of everyone in my class for the Eau de MacRitchie.